NELLIS AIR FORCE BASE, Nev. – The United States Air Force Air Demonstration Squadron Thunderbirds flew over Hollywood and the Santa Clarita Valley Monday afternoon, March 4. 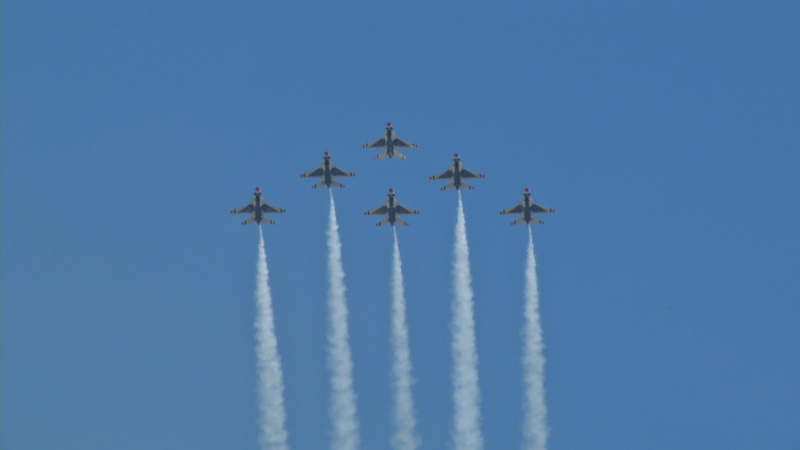 The flyover is in celebration of the upcoming film “Captain Marvel” and in honor of Maj. Stephen “Cajun” Del Bagno, a Thunderbird pilot and Saugus High School grad who was killed in an April 2018 crash. The formation featured six F-16 Fighting Falcons, the Air Force’s premier multi-role fighter aircraft, soaring over Hollywood and the SCV from 12:15 p.m. to 5:30 p.m.
Marvel Studio’s newest film, “Captain Marvel,” will release in theaters nationwide on March 8. The film follows the story of Captain Carol Danvers, an Air Force fighter pilot who goes on to become the most powerful superhero in the Marvel Cinematic Universe. The Thunderbirds have close ties to the film’s production. Last January, in preparation for the film, lead actress Brie Larson and director Anna Boden visited the team during an Air Force immersion and F-16 flight at Nellis Air Force Base, Nev.
During production, the team provided two Thunderbird pilots to advise cast and crew on fighter pilot traditions and culture. One of the advisors was Maj. Stephen “Cajun” Del Bagno, who passed away in a mishap during a routine Thunderbird training flight in Nevada only a week after consulting on-set. Del Bagno, a 2001 graduate of Saugus High School, was a 2005 graduate of Utah Valley State University, and commissioned from Officer Training School, Maxwell AFB, Ala. in 2007. Before joining the Thunderbirds, he served as an F-35A Evaluator Pilot and Chief of Standardization and Evaluation, 58th Fighter Squadron, Eglin AFB, Fla., according to his biography on the Thunderbirds website. He had logged 3,500 total flight hours in over 30 different aircraft, with 1,400 hours as an Air Force pilot, according to the biography. Del Bagno was only in his first season with the Thunderbirds team. In his free time, he was a civilian flight instructor, corporate pilot, skywriter, and a banner tow pilot, according to his biography. He also enjoyed snowboarding, water sports and spending time with family and friends. He was known around the SCV as a neighbor who participated in sports, including varsity soccer and basketball. “Executing this flyover is a fitting tribute to Cajun,” said Maj. Matt Kimmel, the Thunderbirds Lead Solo pilot who advised the “Captain Marvel” team with Maj. Del Bagno. Residents along the flight path can expect a few seconds of jet noise as the aircraft pass overhead, along with the sight of six high-performance fighter aircraft flying less than three feet from each other in precise formation. The Thunderbirds welcome and encourage viewers to tag the team on social media in photos and videos of their formation with the hashtags #AFThunderbirds, #CaptainMarvel, #SuperHeroAirman and #AirForce. For more on the team, go to afthunderbirds.com or follow @afthunderbirds on Facebook, Twitter, and Instagram.